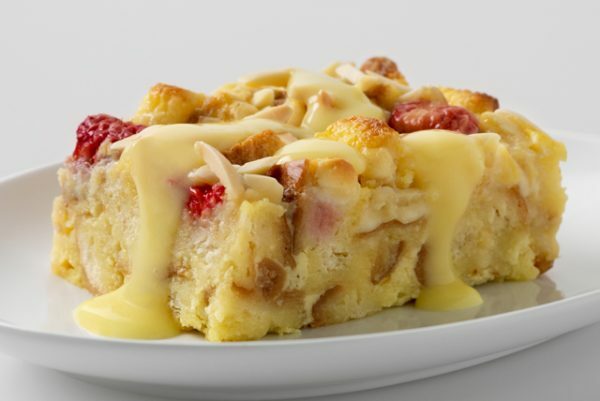 A French bread baguette and vanilla pudding is sweetened with melted white chocolate morsels and juicy raspberries in this easy-to-make dessert. Toss bread with butter; spread onto bottom of 13x9-inch baking dish sprayed with cooking spray. Sprinkle with raspberries and chocolate morsels. Beat pudding mixes and milk in large bowl with whisk 2 min. Reserve 1-1/2 cups pudding for later use; refrigerate until ready to use. Whisk eggs into remaining pudding until blended; pour over ingredients in baking dish. Bake 20 min. Sprinkle with nuts; bake 15 to 20 min. or until knife inserted in center comes out clean. Cool slightly. Cook reserved pudding in saucepan 5 min. or until heated through, stirring constantly; serve spooned over bread pudding.